I didn’t get the second issue of this series, but the third one more than makes up for that! From what I read, of the second issue, it was pretty much a giant fight of the two Hulks. 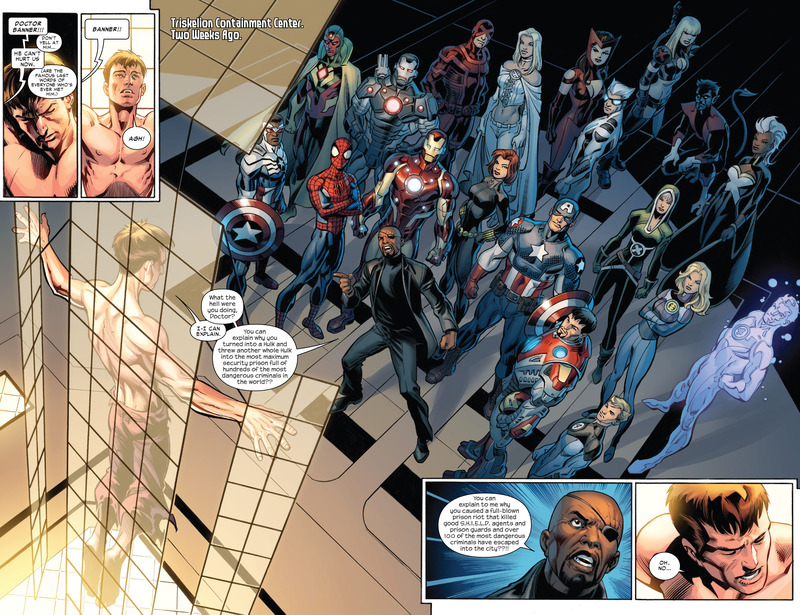 It has been brought to my attention that the versions of characters seen in this series, both the Proper Marvel Universe and the Ultimate Universe – may not actually be those versions of the character. Which probably explains why Ultimate Captain America is just walking around, after seemingly dying towards the end of Cataclysm. Which was with this creative team, so they could just undo that story. Plus, I never really thought Cap died in there, as he was shown running towards the back of the Quinjet prior to it hitting Galactus, so he must have survived that. There was also some wordage that implied that Doom had created and recreated this region, several times. I bright all of this up as the Cyclops, seen in this issue, is not the real Cyclops – as we saw what happened to him in Secret Wars 2015 issue 4. There is no way this miniseries takes place between issues three and four of the main series – that I still only own the first issue of. This issue opens with Bruce Banner, the proper one, is a prisoner of Ultimate Nick Fury’s. All the united heroes, including Magik! – are present. Fury is not impressed with Banner, at all. People died, good SHIELD agents, in the attack that occurred in the prison, and Banner (being a Hulk) is fully responsible. Proper Iron Man wants Fury to calm down, as that’s no way to speak to one of his friends. I thought Ultimate Captain America would just be on the cover but he is there, confronting his Fury. Spider-Man really doesn’t like Fury saying his real name, but Fury was use to saying Ultimate Peter’s real name. Emma reads Bruce’s mind and assures him that he should tell the story. Bruce, as Doc Green, is confronted by Ultimate Banner – who wants Green to stop his research. As a Hulk, all they ever do is ruin everything. They go back to worth until they fight. Which is weird, and maybe this is explained in the second issue, but Doc Green turns pink (like Banner) and loses the goatee while Ultimate Banner turns into a proper green Hulk. Like Ultimate Hulk’s appearance stole the gamma radiation from Proper Hulk and that’s what happened. But Proper Hulk is still Hulk, but pink and with brown hair – so maybe what we are seeing being depicted is him unHulking out? Bruce tries to explain what happened, but it still doesn’t explain it. Maybe it is him using “Hulk out” that is throwing me off, as it appears like he did the opposite. He Hulked down. Fury has heard enough and tells everyone to leave. I do like Proper Tony claiming Bruce as a friend, I guess in times like these, those of a same universe just stick together. Falcon tells Tony to back down. Tony tells his universe folks that Fury is looking for an excuse to start locking them up. 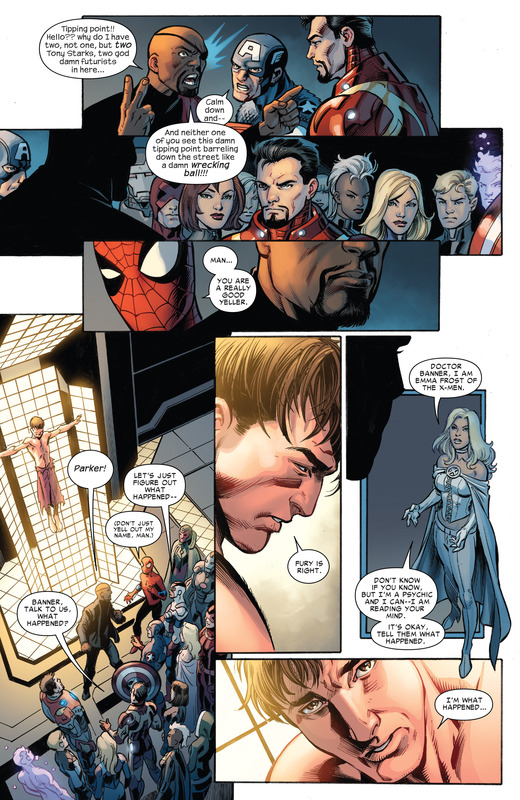 Tony walks away, and passes by Magik. I love Bagley, but showing Illyana having her soulsword holstered, is a mistake. How is that sword attached to her? Does she have a giant belt loop where the widest part of the sword can go into. Poor Banner, he just wants to help. We get to the second half of the issue and we get a little awkward section. We see Frank Castle, in prison guard, gets to a safe house. This must be the Ultimate Punisher, right? He has a black belt. Proper Punisher, I imagine, comes in, and he has the classic white gloves, white boots and matching gloves but Ultimate Punisher throws a knife and kills him so quickly. 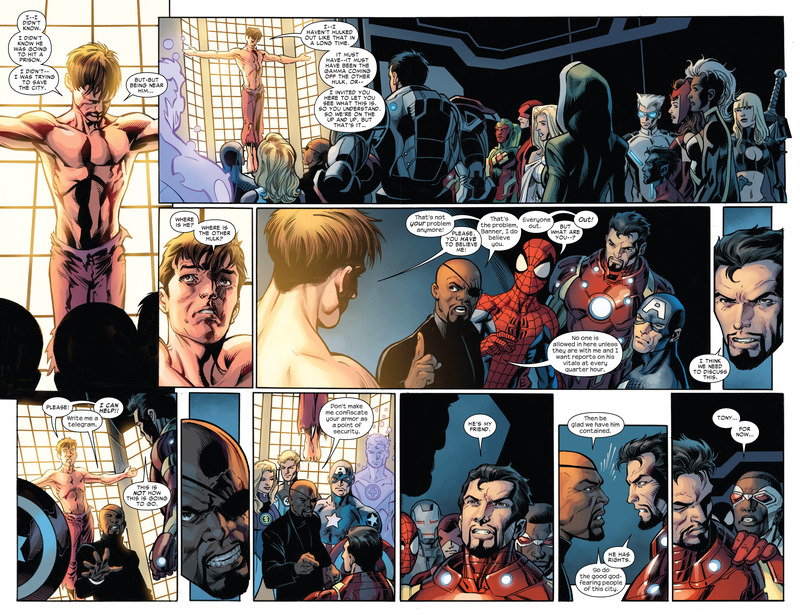 So this is awkward as I can’t imagine the Proper Punisher dying so easily – even if confronted by an Ultimate version. Proper Punisher has been an angel, has been turned into FrankenCastle, I mean, he shouldn’t be that confused. But he also hasn’t been this blood thirsty to kill costumed folks so that’s why I think it is Ultimate Punisher, moving on. Brooklyn. Bombshell confronts Proper Wrecking Crew (as their Ultimate counterparts are, Damage Control). The Wrecking Crew are angry as they are forced to become bank robbers so that they can make some money, so they don’t mind that they are four grown muscle men, about to fight a high school student. Just then, Thunderball gets a bullet through his head. Punisher kills Wreckler, Piledriver and finally, Bulldozer. He turns his eye to Bombshell but we cute to a new scene – so if she doesn’t die on panel, I would like to think that he didn’t kill her. Even though he narrates, this is the only way it could end. Triskelion Containment Center. Two scientists are looking over Bruce, he’s trying to help them but they are not amused. Just then, the power goes out. Which is weird, as one of them claims that it is impossible to have a power outage, when it happens ALL THE TIME! 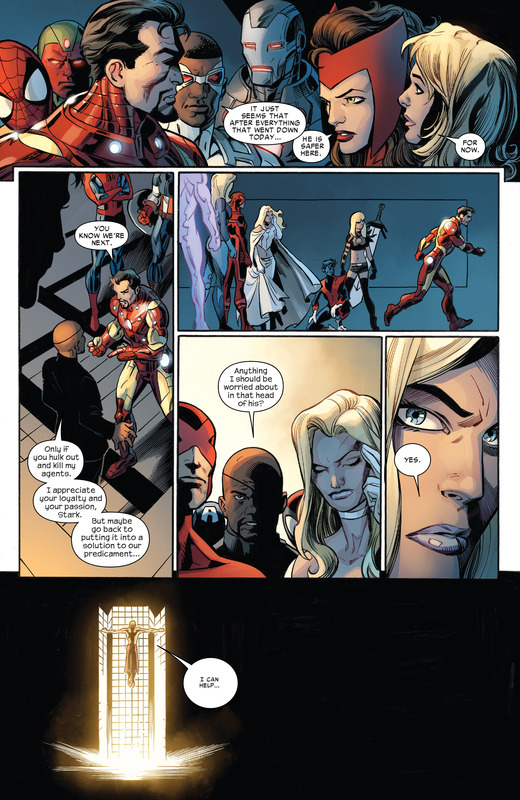 Issue ends with Banner, inside an Iron Man suit, as Tony brings him to safety. Not really sure where this series is heading. 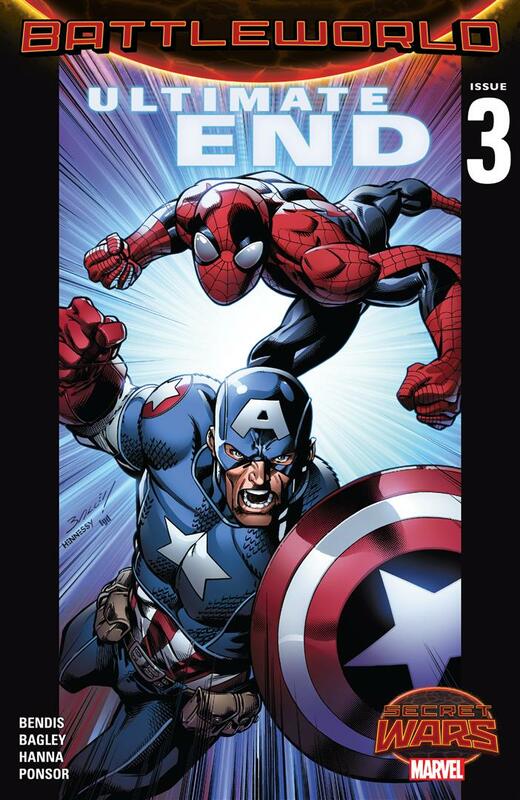 Clearly this series isn’t going to end with the two universes separated, as Secret Wars 2015 will have that big moment. 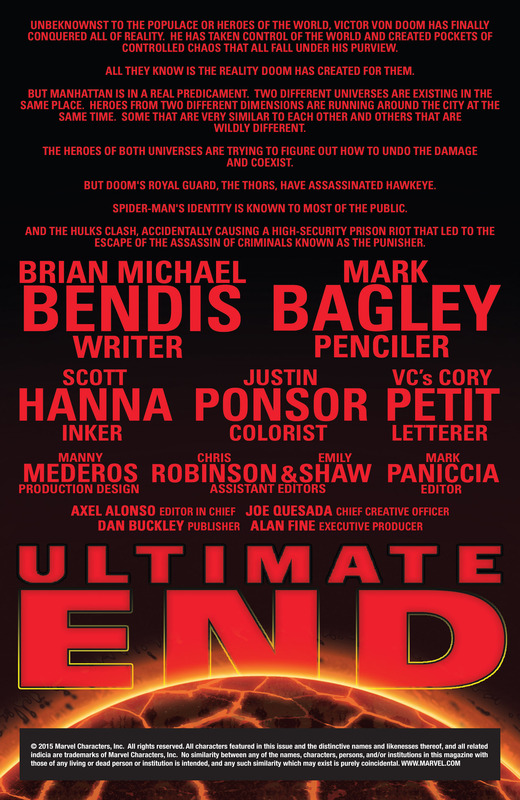 So is this just a very fancy Punisher Kills the Marvel Universe, which I will be all for, but it sure doesn’t feel like the last hurrah for the Universe Universe, like I thought it was going to be.